Most of the remainder of the film is Locke driving down the motorway, alone in his car, talking on a hands-free telephone with people affected by his decision. They include his furious boss, hurt and angry wife, bewildered children, and a number of people in London, one of whom he feels he must visit. He also attempts to talk his hapless assistant through the final stages of the construction project, and make some vital last-minute calls to ensure the foundations are poured successfully. Locke has a deep respect for building, and above all for concrete. He knows he may well be fired for suddenly leaving at such a crucial moment, but does his best to see the project through. He is known to all as a conscientious and reliable man, so his colleagues and family are deeply shocked at his behaviour. Locke himself is unaccustomed to being in an emotional situation. He remains stoic, calm and collected on the telephone. Only when it is off, in the privacy of his car, does he shout, swear and hit the steering wheel. At times he directs angry monologues towards his father, as if he was sitting in the empty back seat. The direction does not allow us to forget that Locke is driving at up to ninety miles an hour down the motorway. His emotional distress, a slight cold which causes him to sneeze and wipe his nose, or simple actions like rummaging through a folder take on an almost unbearable tension at times. The film plays out almost in real time as Locke continues his drive. We don't know if he will reach his destination, or what exactly he will find there, but through his telephone conversations we can hear that his life is rapidly falling apart. This film would be completely impossible without a strong central performance. The majority of the film is Locke in the driver's seat of his car, talking to disembodied voices on the telephone. Tom Hardy rises admirably to the occasion. He is absolutely believable and compelling throughout. 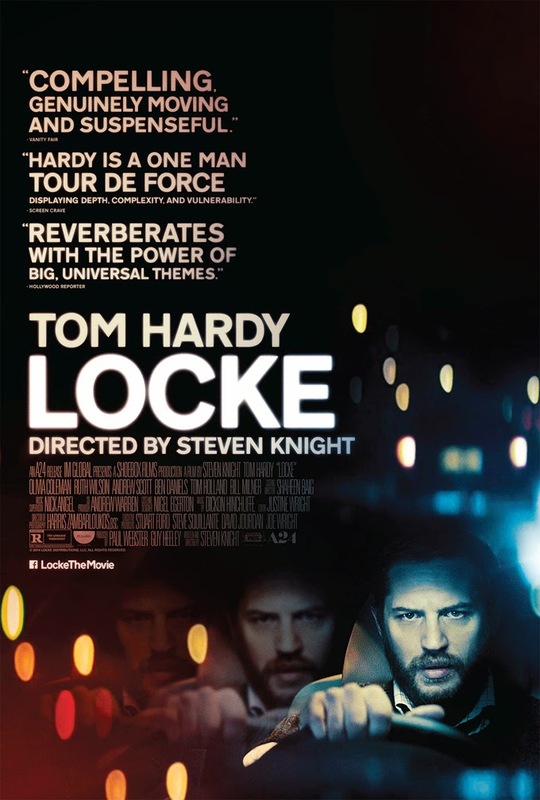 Locke is written and directed by Steven Knight, best known for Dirty Pretty Things and Eastern Promises. With Tom Hardy's indispensable help, Knight has produced a tense, emotionally gripping film from the simplest of components.